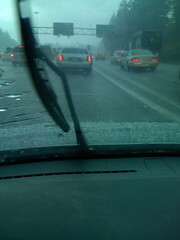 Driving down I-5 from Northgate to Capitol Hill, hail comes down in great, great drives. Highway full of ice. Car windows sounded as if they were about to break. Lightning a few miles ahead, ker blooey. But no accidents, and everyone kept on driving...just...slowly.